"Recall of dog food happens many times each year, across many companies and brand names. Use this guide to find your brand, symptoms to watch for, and any recourse you might have. For a complete list, visit the FDA website listed below." We hate to hear about the recall of dog food. It was shocking for many of us to learn that 53 brands of dog food and 42 brands of cat foods are made in the same manufacturing facility, have many of the same ingredients and unfortunately were subject to a 2010 recall that was making our pets ill. Since this time, we frequently update this information to make sure your pet is protected from future recall of dog food alerts. 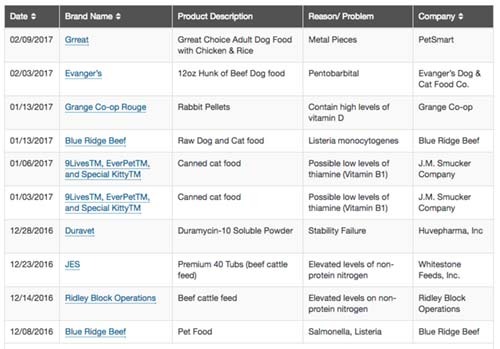 The FDA continually updates a recall of dog food recall of dog food list; they keep current and archived records. Your ability to sue over injury due to a recall of dog food depends on the State you live in. Unfortunately in most States a pet is considered property, with damages limited to the price you paid for your dog. If there is a class action lawsuit due to a recall of dog food where all owners come together, there is a better chance of punishing the offending company. 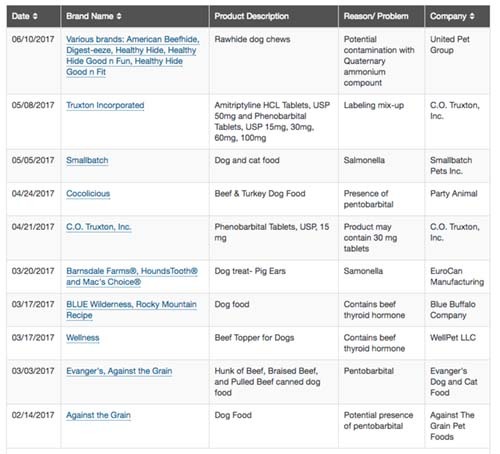 With over 50 brands of Dog Food on the recall list your best bet is to click on this link which connects you to the official U.S. Government recall list - Food and Drug Administration Recall of Dog Food List. Not all products from affected brands are on the recall list. If your dog shows signs of illness such as loss of appetite, acts tired (lethargy) or is vomiting; you should call or visit your veterinarian immediately. The American College of Internal Medicine (ACVIM) has recommended that dogs that ingested pet food that was on the recall list, whether showing signs of illness (lethargy, vomiting, diarrhea, anorexia (weight loss, loss of appetite) or is showing no symptoms at all (asymptomatic) should be seen by their veterinarian. Your veterinarian will check the Kidney function of your pet, the most likely problem to be caused by tainted pet food. Symptoms usually appear within a couple of days of eating the food. The three most important dog food recall symptoms are tiredness (lethargy), loss of appetite and vomiting. Be sure to keep the food and the packaging of the recalled for so that you can check if the packaging matches the recall and if you need to take later legal action. We will continue to update our recall of dog food list as new items come to our attention.